SEOUL, South Korea, Jan. 16, 2019 /PRNewswire/ -- Robot Factory developed an unique singular module based robot platform called PingPong, which can create hundreds of robots with an easy assembly and provide an opportunity to enjoy fun activities at an affordable price. Many car shaped robots are capable of driving, crawling or walking robots and are usually expensive and complicated to make. It also takes up a lot of time to assemble. Everything starts from the idea of creating a robot platform with huge extensibilities, easy operations and inexpensive prices. 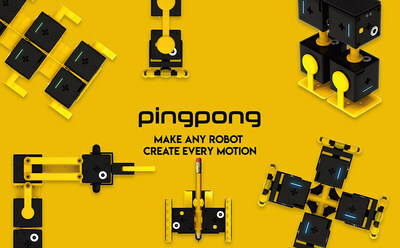 Robot Factory presents a new paradigm in the history of robotics toy, PingPong: a single module based robot platform. PingPong is a single modular robot platform. Each Cube has BLE 5.0 CPU, battery, motor and sensors. By combining Cubes and Links, the user is able to build any robot model they want within several minutes. Robot Factory solved many technical problems to create this innovative platform, making it possible to construct running, crawling and walking robots with a single module. Other than synchronization, group assembly and charging problems, the company also takes care of PinPong Cube grouping issues. On top of that, velocity and absolute angle motor control technology becomes available; older versions of smartphones have great compatibility and smart devices and IR remote controllers can be used to move the robots simultaneously. In addition, controlling hundreds of Cubes with a single device is now possible, utilizing successive Bluetooth networking technology. As a result, an easy, fun, new robot platform finally came into light at affordable prices and unlimited extensibility. While PingPong will be unveiled at the 2019 BETT Show in London and the Nuremberg International Toy Fair, it will also be launching on Kickstarter next year in January 2019. Robot Factory strives to make PingPong a new standard in robot entertainment, SW education and the makers market.